Chinese Internet giant Tencent has confirmed that it is planning to introduce payment services to WeChat, its popular mobile chat app, firming up plans that many industry watchers and users had suspected for some time. The Wall Street Journal reports that Lai Zhiming, who heads up TenPay — Tencent’s third-party payment platform — told media that the app , which passed 200 million users in September, will integrate with the PayPal-like service within the next two months. The executive didn’t explain how the two services will work together, but did say that users will be able to buy items by scanning their codes at stores. It may have been expected for a while, but the news is significant as it gives the messaging app, which acts like a wholly Tencent-controlled Internet channel, the potential to make big money for the company. It will also encourage retailers to sign-up to market and advertise via the platform. Rival services like Line and Kakao Talk — which Tencent owns a share of — make money by offering ads and opt-in marketing to brands that set up accounts and provide messages and promotions to users. WeChat also uses the latter, having signed up a bevvy of top brands, including Starbucks and Nike, although it doesn’t yet offer advertising. WeChat, a competitor to US-based WhatsApp and a host of other apps, let users chat via text, voice and video using nothing more than an Internet connection. It dominates the local market in China and has even encroached on Sina Weibo, China’s version of Twitter; which is something that few other services have ever threatened to do. Speaking on the Sina earnings call last week, chairman Charles Chao went so far as to name WeChat as a direct competitor. Although its total user count has passed 400 million, users of Sina’s Weibo microblog are spending less time on the service because of Tencent’s mobile chat service, Chao conceded. Sina is still struggling to monetize mobile, just 15-20 percent of its advertising money comes from mobile despite the majority of its members using the service from mobile devices. Tencent’s move to bring payments to WeChat will heap more pressure on the firm, which operates one of China’s largest news portals in addition to its Weibo service. Tencent says that WeChat is seeing strong adoption outside of China. Alongside Line, Kakao Talk and WhatsApp, the service is being targeted at Southeast Asia, where smartphone adoption is growing rapidly. Indeed, yesterday the service hit 1 million users in Malaysia, just five months after its local launch there. The apps are rivaling Facebook and other social networks for attention in Asia. 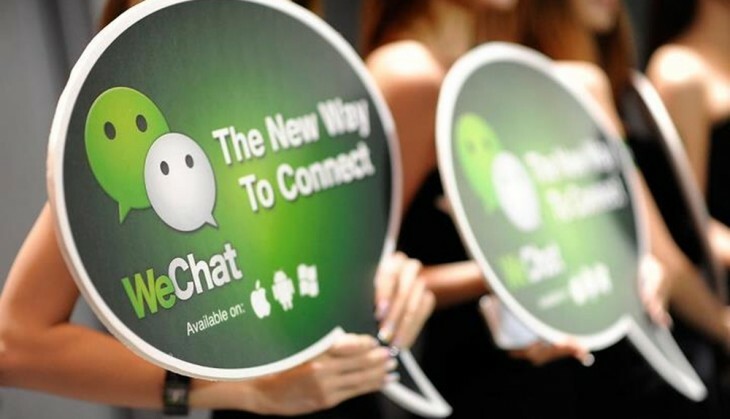 WeChat, for one, allows publishers and websites to push news directly to users (that opt-in to updates) and, with its growing user numbers, WeChat is becoming a potentially lucrative channel for Tencent – which runs the hugely popular MSN Messenger-like QQ service for PC based messaging.